Rejoice, oh Android lovers. 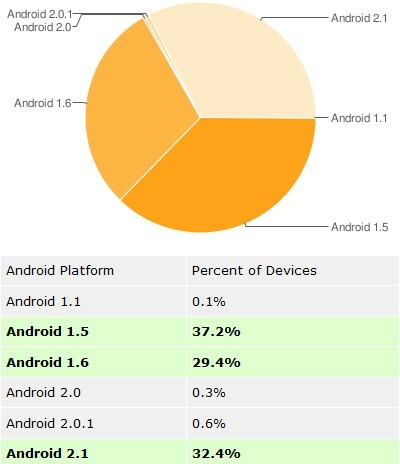 Thy OS of choice has finally graduated to the point where its latest variant is also the most used -- a statistic that is likely to last for only a day given Google's intent to reveal Android 2.2, or Froyo, at its I/O conference tomorrow. For the first time since El Goog's been keeping these platform version stats, 2.1 has risen above 1.5, the previous incumbent, having grown from 32.4 percent on May 3 (chart after the break) to 37.2 percent on May 17. This rapid ascension can only be expected to accelerate with more devices getting their Eclair permissions slips, and let's not forget that Google will be trying its hardest with 2.2 to make upgrades easier for phone makers to implement. Onwards and upwards we go.